Reformed Dutch death metal outfit ASPHYX — Martin van Drunen (vocals), Wannes Gubbels (bass/vocals), Paul Baayens (guitar) and Bob Bagchus (drums) — will release its comeback album, "Death...The Brutal Way", on June 22 via Century Media Records. War Anthem Records will release the LP version of the effort, which was recorded at the Sonic Assault studio and engineered by Frank Klein Douwel (who is also the band's live sound engineer). Mixing duties were handled Dan Swanö (NIGHTINGALE, EDGE OF SANITY and BLOODBATH fame) at Unisound in Sweden. Commented drummer Bob Bagchus: "We, ASPHYX, are proud to present that we just have refreshed the deal with our longtime label partner Century Media Records. We were one of their very first death metal signings in early '90s and we are very happy to see our new album, 'Death...The Brutal Way', being released by this very label. We, ASPHYX, are very excited about our new record since it's exactly, again, what we want to do as a band. It's dark, it's very heavy, it's extremely krushing and, most importantly, it comes from our souls. Songs like 'Asphyx II (They Died As They Marched)' or 'Bloodswamp' are probably amongst the heaviest death metal monsters ever. Also we are looking forward to the album release show in Essen. It will be great to play monsters like 'Black Hole Storm', 'Cape Horn' and 'Asphyx II (They Died As They Marched)' and many more live on stage." The group previously said about the new CD: "Cliché or not, this truly IS the heaviest ASPHYX album of all. This could easily be THE real follow-up to 'The Last One On Earth'. The songs are as always catchy, brutal and straight-forward. The slower parts have become even more slow and heavier than ever before. This is doom/death metal in the real ASPHYX spirit. This will grind everything to its grave! This is death metal as we, ASPHYX, like it best. Old school to the bone!" 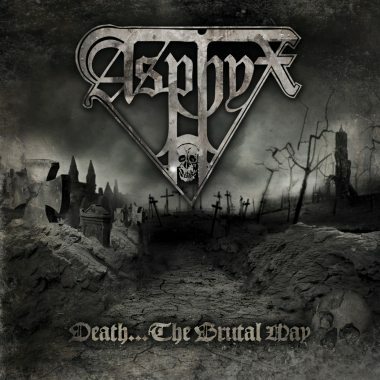 ASPHYX last year released a seven-inch EP, "Death the Brutal Way", via Iron Pegasus Records. The single includes the brand new title track plus a cover of CELTIC FROST's "Os Abysmi Vel Daath" from the Swiss legends' "Monotheist" album. Both cuts were recorded in January 2008 at the Harrow studios. You can listen to "Death the Brutal Way" on the group's MySpace page.